Home / FAQ Management: Getting Started / How do I export FAQs? How do I export FAQs? You can export FAQs as a CSV or HTML file. 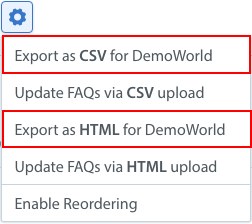 To do so, navigate to the FAQs section, click the Settings gear to the right of ‘New FAQ’, then select ‘Export as CSV for [appname]’ or ‘Export as HTML for [appname]’. When you export the FAQs as CSV, a zip file is downloaded. This file contains the CSV files of your FAQs and all of your FAQ sections. The CSV file also contains the Publish ID, Status of the FAQ (Published/Unpublished), the FAQ title, content, and translations. To use this process to bulk update your FAQs see How do I bulk update FAQs? To import FAQs, see How do I import FAQs?